Breast cancer is many women’s worst fear. But experts have made great progress in treating cancer. If it is found early, breast cancer can often be cured, and it is not always necessary to remove the breast. Having a history of radiation treatment to the chest. Not having children, or not having children until after age 30. Many people think that only women get breast cancer. But about 1 out of 100 cases of breast cancer occurs in men. So any man who has a breast lump should be checked. If you or your doctor finds a lump or other change, the doctor will want to take a sample of the cells in your breast. This is called a biopsy. Sometimes the doctor will put a needle into the lump to take out some fluid or tissue (needle biopsy). Or if the doctor cannot feel the lump, a special type of X-ray can be used to guide the needle. This is called stereotactic biopsy . In other cases, a surgeon may take out the whole lump through a small cut in your breast. The results of the biopsy help your doctor know if you have cancer and what type of cancer it is. You may have other tests to find out the stage of the cancer. The stage is a way for doctors to describe how far the cancer has spread. Your treatment choices will be based partly on the type and stage of the cancer. Most people who have breast cancer have surgery to remove the cancer. The surgeon may also take out some of the lymph nodes under your arm to find out if the cancer has spread to this area. After surgery, you may have radiation therapy to destroy cancer cells. You may also get chemotherapy or hormone therapy. These are powerful medicines that travel through your body to kill cancer cells. You might have radiation, chemotherapy, or hormone therapy before surgery to help shrink the cancer. 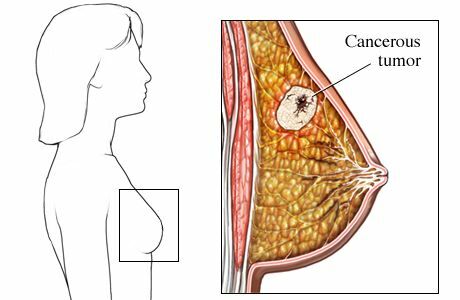 Surgery to remove just the cancer from the breast (breast-conserving surgery, or lumpectomy). You will need to have several weeks of radiation after surgery. Surgery to remove the breast (mastectomy). If you choose mastectomy, you can have an operation to make a new breast. This is called breast reconstruction. Sometimes radiation is not needed after a mastectomy. In years past, having breast cancer meant that you would have to have your breast removed. In many cases, this is no longer true. Studies now show that for early-stage breast cancer, breast-conserving surgery followed by radiation therapy is as good as mastectomy. You and your doctor will decide which mix of treatments is right for you based on many factors. These include facts about your cancer as well as your family history, other health problems, and your feelings about keeping your breast. Learn all you can about breast cancer and its treatment so you can make the choices that are right for you. Treatments for breast cancer can cause side effects. Your doctor can let you know what problems to expect and help you find ways to manage them. Finding out that you have breast cancer can cause a range of feelings, from sadness and fear to anger and despair. If your emotions are making it hard for you to move ahead, be sure to tell your doctor. You may be able to get counseling or find a support group. Talking with other people who have faced the same choices can be a big help. Eat a healthy diet with lots of fruits, vegetables, and whole grains. Stay at a healthy weight. Getting regular exercise and watching what you eat can help. If you drink alcohol, limit the amount. After menopause, even having one drink a day or less may increase the risk for breast cancer. Still, there is no sure way to prevent breast cancer, so it is very important to have regular exams and mammograms. Discuss your risk factors with your doctor to find out how often you should have a mammogram. If you have a strong family history of breast cancer, ask your doctor about genetic testing. A blood test can check for changes in the BRCA genes that may increase your chance of getting breast and ovarian cancer.